P8SE | Tappan Tech1 14 SEER Package Air Conditioner State-of-the-Art Compressor: Copeland scroll is a standard component. • Micro-Channel Coils: Both indoor and outdoor coils are robustly designed for harsh conditions while reducing unit weight and refrigerant charge. • 5-Speed ECM Blower Motor: Provides greater airflow flexibility even in challenging duct applications. • Proven, Industry Standard Components: Easier service and availability. • TXV Externally Equalized: Provides precise refrigerant control under varying load conditions. • High and Low Pressure Switches: Added compressor protection. • Liquid Line Filter Drier: Insures clean and dry refrigeration system. • Externally Accessible Service Ports: Quick access to refrigerant system without disrupting operation. • Compact Footprint/Low Profile: Easy to handle and transport. • Convertible Air Delivery: Horizontal or down flow to accommodate slab or rooftop application. • Heavy-Gauge, Full Perimeter Base Rails: Facilitates forklift handling and curb mounting. • Galvanized Steel Cabinet: Polyurethane finish provides 950 hours salt spray protection. • Wire Guard Coated with Earth Friendly Epoxy and Mesh Hail Guard: Will never rust and protects the coil from being damaged by balls, lawnmowers, hail etc. • Drain Pan: Quickly drains away evaporator condensate. • Quiet Operation and Low Vibration: Fan blade combined with custom venturi condenser fan. • Access to Controls and Major Components: Easy in and out service. • Service Access Panels: Allows easy access to all major components and the compressor. Designed to make servicing easier for the Contractor. • Corner Protectors: Prevent injury from sharp edges of unit's top pan. • Easy to Install: Electric heat strip provides up to 20 KW of heat output. • Accessories: Roof curbs, title 24 compliant economizers, fresh air dampers and more . Q6SE | Tappan Tech1 14 SEER, 8 HSPF Package Heat Pump ,R8GE | Tappan Tech1 14 SEER, 81% AFUE Gas/Electric Package Unit Exceptional 10-year all-parts warrantyLong-lasting peace of mind with 10-year Tappan Tough Quality Pledge to replace the entire unit if the compressor or heat exchanger fails Product registration requiredHigh-Quality, Enhanced Coils: Both of the coils in the gas/electric packaged system are corrosion resistant.Smooth Operation Levels: Because of a 20-inch fan blade and a custom venturi condenser fan, this model is both quiet and smooth.Quality Coil Protection: The coils are protected by two components - a wire coil guard in an Earth-friendly epoxy and a never-rust mesh hail guard. These provide protection against balls, lawnmowers, hail and more.Durable Construction Materials: The R8GE was designed with quality in mind. The cabinet of this packaged system is made of galvanized steel coated in a corrosion-resistant, polyester-urethane finish.Peak Quality Assured: We check each packaged system we manufacture at the factory 72 times before it is shipped. At Tappan, our gas/electric packaged equipment is durable and efficient. 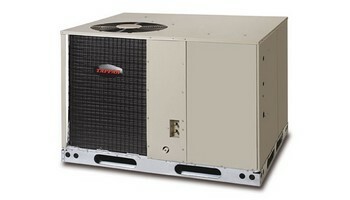 This particular model, the R8GE series, offers 14-SEER cooling and up to 81% AFUE heating efficiency. This way, you stay comfortable year-round and may save on utility bills. Ask your contractor if this is the right heating and cooling model for your home.Corrosion-Resisting, Enhanced Coils: Tappan gets tough on corrosion by including advanced coils that perform better than traditional coils in corrosive environments.Quiet with Low Vibration: This unit features a 20-inch fan blade combined with custom venturi condenser fan for quiet operation.Durable, Resistant Coils: Each Tappan packaged system includes two corrosion-resistant coils that increase system durability.Backup Heat When You Need It: The optional electric heat strip provides 20 kw of backup heating power.Increased Durability: Tough exterior provides protection. It is constructed using galvanized steel coated in a corrosion-resistant finish.Built to Last: We use 72 product checks at the factory to ensure that you are getting the best system possible. The Q6SE series of packaged heat pumps offers budget-friendly efficiency and exceptional performance features. This unit is durable - with a corrosion-resistant exterior and quality coils - and offers 14-SEER cooling efficiency paired with 8.0-HSPF heating efficiency. Ask your contractor whether this largest footprint heating and cooling system is right for your home.High-Quality Coil Technology: Tappan packaged equipment includes two corrosion-resistant coils for durable performance.Guarded Coil: A wire coil guard coated in an Earth-friendly epoxy and a never-rust mesh hail guard provide superior protection against balls, lawnmowers, hail and more.Quiet, Smooth Operating Levels: A 20-inch fan blade and custom venturi condenser fan promote smooth, quiet operation.Backup Heat Capability: An optional electric heat strip can provide 20 ke of heat backup when you need it most.Durably Constructed: This packaged system is manufactured using tough materials. This unit is made using galvanized steel coated in a corrosion-resistant, polyester-urethane finish.Commitment to Quality: At Tappan, we are committed to providing you with the best units possible. That is why every packaged unit is checked 72 times before it leaves the factory. Tappan P8SE packaged air conditioners offer efficient performance with a budget-friendly price tag. This unit is 14-SEER and comes in a large footprint for installation flexibility - it can be installed on either a roof or a slab. If you are considering this packaged system, talk to your local Tappan contractor.